Mice lacking MIR-137 show ASD-ish phenotype + increased Pde10a. Recent studies of complex brain disorders such as schizophrenia and autism spectrum disorder (ASD) have identified a few "master keys," risk genes that sit at the center of a network of genes important for brain function. Researchers at Emory and the Chinese Academy of Sciences have now created mice partially lacking one of those master keys, called MIR-137, and have used them to identify an angle on potential treatments for ASD. Mice partially lacking MIR-137 display learning and memory deficits, repetitive behaviors and impaired sociability. MIR-137 encodes a microRNA, which regulates hundreds of other genes, many of which are also connected to schizophrenia and autism spectrum disorder. By treating mutant mice with papaverine, a vasodilator discovered in the 19th century, scientists could improve the performance of the mice on maze navigation and social behavior tests. Papaverine is an inhibitor of the enzyme Pde10a (phosphodiesterase 10a), which is elevated in mutant mice. Other Pde10a inhibitors have been tested in schizophrenia clinical trials, but the new results suggest this group of compounds could have potential for some individuals with ASD, says senior author Peng Jin, PhD, professor of human genetics at Emory University School of Medicine. Having just the right level of MIR-137 function is important. Previous studies of people with genetic deletions show that a loss of MIR-137 is connected with intellectual disability and autism spectrum disorder. The reverse situation, in which a genetic variation increases MIR-137 levels, appears to contribute to schizophrenia. "It's interesting to think about in the context of precision medicine," Jin says. "Individuals with a partial loss of MIR137 -- either genomic deletions or reduced expression -- could potentially be candidates for treatment with Pde10a inhibitors." To create the mutant mice, Jin's lab teamed up with Dahua Chen, PhD, and Zhao-Qian Teng, PhD, scientists at the State Key Laboratories of Stem Cell and Reproductive Biology and Membrane Biology, part of the Institute of Zoology, Chinese Academy of Sciences in Beijing. Jin says that generating mice with a heritable disruption of MIR-137 was technically challenging, taking several years. Mice completely lacking MIR-137 have problems with development and die soon after birth. The effect is similar if the deletion is restricted to the nervous system. Other "knockouts" of microRNA genes have not displayed such distinct post-natal effects, Jin notes. However, the scientists wanted to study animals that had one copy intact -- a situation analogous to the humans with ASD. "Several studies had shown an association between MIR-137 and both ASD and schizophrenia, but it was very important to show that causal relationship," Jin says. Mice with one copy of MIR-137 disrupted in the brain learn to navigate mazes with more difficulty than controls. They also display increased repetitive behaviors (self-grooming and marble-burying) and show a limited preference to socialize with another mouse rather than an object, and do not discriminate familiar mice from strangers. The brains of mutant mice have a higher density of dendritic spines, indicating that they have impaired synaptic pruning, a process other researchers have observed is altered in schizophrenia and autism. Analyzing the genes in brain cells whose activities were most altered by MIR-137 loss allowed the researchers to pinpoint Pde10a. Treating mutant mice with papaverine improved their ability to learn mazes, although it did not restore their performance to that of control mice. In addition, papaverine treatment significantly increased the amounts of time mutant mice interacted with other mice. 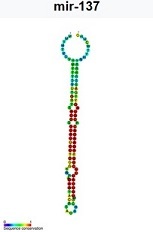 Illustration: miR-137 microRNA secondary structure and sequence conservation. Wikipedia.